Canadian whisky brand Crown Royal is reminding consumers to stay hydrated between alcoholic drinks as the NFL American football season gets under way. The Diageo-owned brand is expanding upon the Hydrate Generously platform from 2017 with its “largest-ever responsible drinking campaign”, called The Water Break. This NFL season, Crown Royal will be reminding American football fans to take an off-the-field water break, which aims to encourage responsible consumption on match days and emphasises the importance of hydrating between alcoholic drinks. The fully-integrated campaign kick-started with a televised 30-second advert across the US, which was broadcast during the season opener on Thursday (6 September). 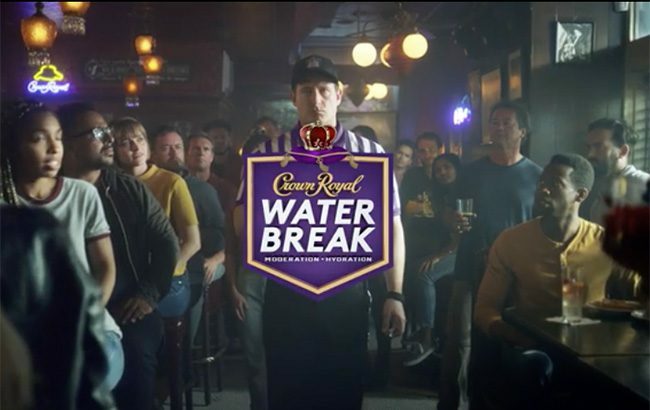 The advert features a referee signalling for a time out for an official Crown Royal Water Break, when fans take a break to hydrate. It will continue to air during the first half of games throughout the season. Crown Royal will also be teaming up with former professional footballers Brian Westbrook, DeMarcus Ware and Ed Reed to further highlight the campaign’s message. Sophie Kelly, senior vice president of North American whisk(e)ys at Diageo, said: “Crown Royal is taking responsible drinking to the next level with an initiative that’s more than just a message; we are looking to change behaviours and ultimately make a positive social impact. “Simply put, the Crown Royal Water Break reminds sports fans not to ruin the game day celebrations for everyone else by over consuming.